This article today is to enable you to build your competency in a niche investing segment called REITs. I have written a few articles in the past diving into REITs as an investment. If you are lost in this article, you might want to check out my REITs Training Center which organize the content in a sequential manner. When we invest in a portfolio of real estate investment trusts (REIT), we are looking for a total return made up of capital gains and dividends (which is no different from many other investments). Therefore many investors are attracted to the REITs that pays a more decent dividends. To pay the dividends, the underlying properties that a REIT own need to earn adequate rental cash flows to cover the amount of dividends required. This is not always going to be the case and the managers have a few ways to boost the cash flow of the REIT in order to provide the dividend. What this means that if we go by the traditional way of looking at property rentals, the organic cash flow can only allow the REIT to pay out a lower dividend. With this artificial boost, more dividends can be paid out. One of the most prevalent ways the manager can do to boost the cash flow is to pay their management fees in units instead of cash. REIT is a trust structure and the manager have a scope of work to strategize the direction of the REIT, manage the properties, carry out risk management planning, seek out opportunities. All these will be charge a fee that is deducted. The amount of fees could be between 0.6-1% of Total Assets. Many REIT managers, in the initial stage of the REIT (and some for a prolong duration) made the decision to pay in units. This means that the trust saves money, which means a larger pool of cash flow to pay out to shareholders. You can typically find information that show evidence of this in 2 places. In a REIT’s annual report or financial statement, there is a section after the statement of total return that provides the adjustment from the net profit of the REIT to derive the cash flow available for distribution. The above is taken from a Singapore listed industrial REIT Mapletree Industrial Trust. 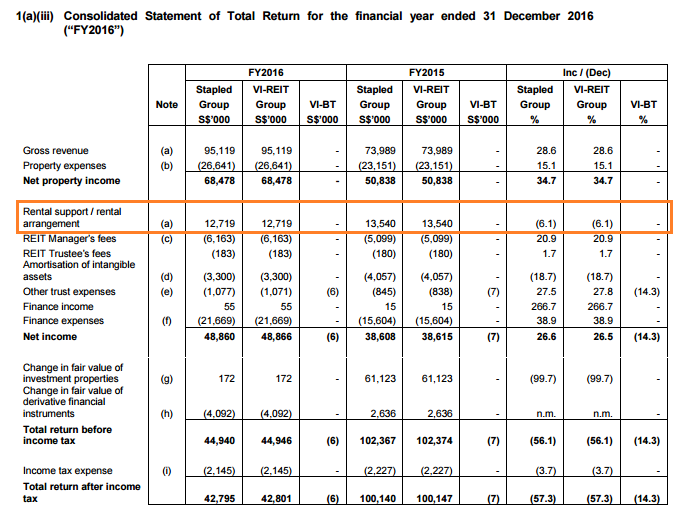 We can see the net profit, or total return after tax in FY16/17 is $270 mil. However, income available for distribution is $204 mil. Note C breaks down the adjustment. Notice that there is a line item called Management fees paid/payable in units, which amount to $2 mil. 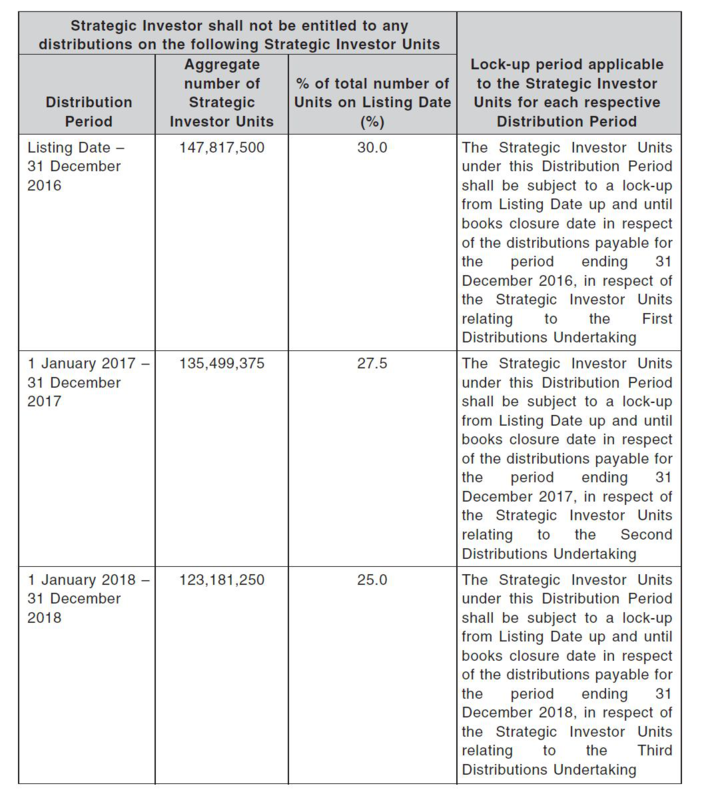 This is where it shows the amount that the REIT manager chose to take as units, thereby saving cash flow to increase the cash flow available to pay out shareholders. 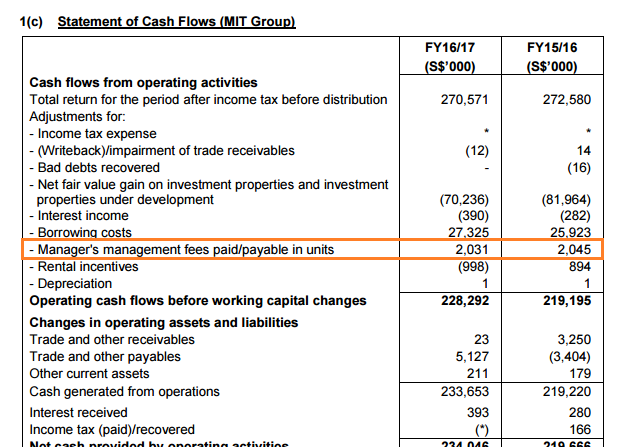 What is not shown here is that in the Statement of Total Return, the total management fees earned by the manager is closer to $25 mil, so they are only taking a small amount out. The above statement of total return and cash flow amount available for distribution belongs to Cache Logistics Trust. We can see that the total manager fees is about $1.8 mil for the quarter and the manager chose to take $1.4 mil worth of fees in units. This amount, is about 9% of the income available for distribution. The statement of cash flows is a standard part of the financial statements which shows the break down of the actual cash inflows and outflows of a business. The above statement of cash flow is taken from Mapleetree Industrial Trust. 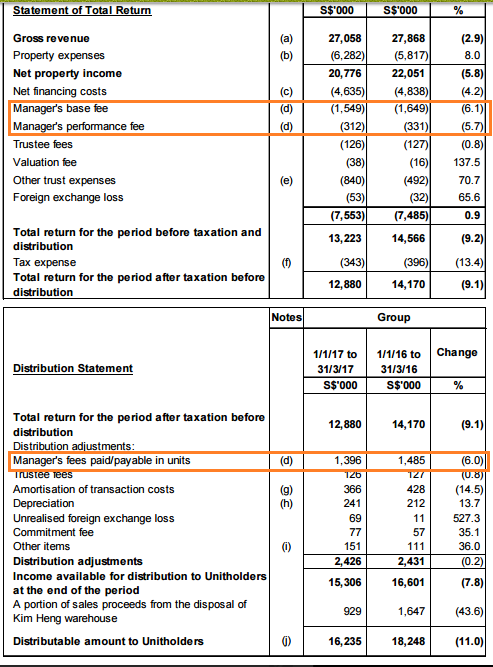 You can see under cash flows from operating activities, there is a similar line items. Doing this will definitely boost the cash flow available for distribution. On the other hand the manager will increase the amount of units of the trust. This dilutes the future earnings or cash flow per share of the REIT minority shareholders (you). If the manager continues to do this, you get more diluted and the manager owns a larger portion of the REIT. This may or may not be a bad thing. Dilution means you earn less, but some would prefer the manager to have more skin in the game. The manager usually sells off the units in the stock market to get the cash. The downside is that you have more units outstanding so the dilution is permanent. Some listed companies allow the shareholders to choose to take their dividends as cash or in units. The latter is called taking Scrip. In other countries this is called a DRIP plan. Instead of taking cash, you choose to take your dividends as units. If a percentage of the overall shareholders choose to do this, then that means the REIT needs less cash flow to payout dividends to shareholders. For some REITs in the incubation stage, or during strategic periods, the sponsor, who is the majority shareholder of the REIT, can choose to take scrip so as to support the dividends. In Singapore, most REITs have a key sponsor who owns a sizable chunk of the REIT. Or they could have key majority investors. For example, Temasek owns 34% of Mapletree Industrial Trust. China Businessman Tong Jin Quan and Soilbuild owner Lim Chap Huat collectively owns 70% of IREIT Global. 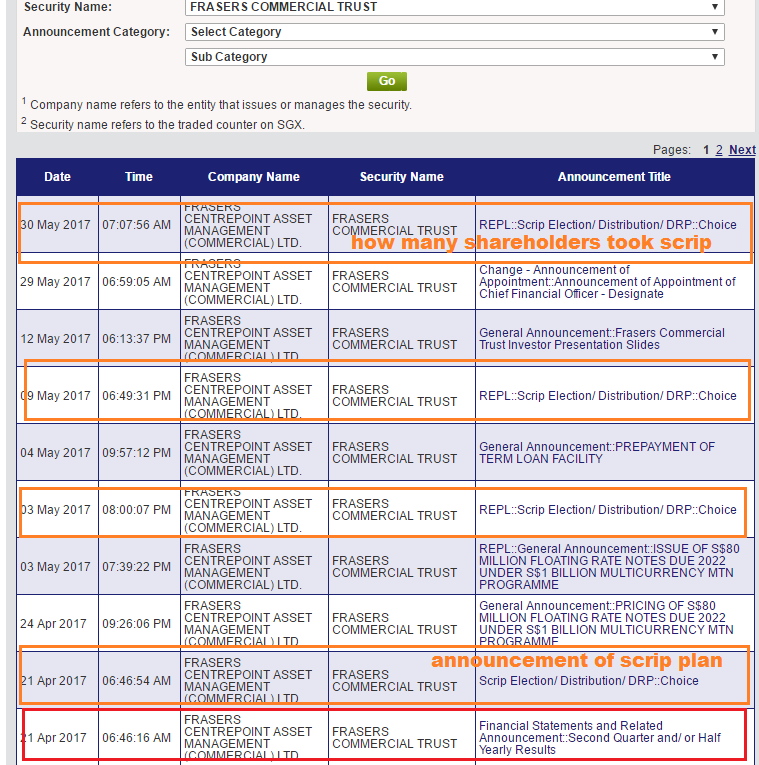 If they chose to take part of their dividends in scrip, then it will mean the REIT can have a higher cash flow to pay out a higher dividend. To tell whether a REIT is issuing scrip, we can go to SGX > Announcement. Select the name of the REIT you are looking up. The above shows Frasers Commercial Trust announcement. On 21st Apr, the trust announced their second quarter results. On the same say they provided details of the scrip plan. In a number of days, more information about the scrip plan is announced. In the last announcement, the trust announced that 3 mil units was issued at a price of $1.3216. This means that the trust saved $3.96 mil. For that same 2nd quarter, Frasers Commercial Trust declared $0.0251 in dividend. They will need to pay out $19.9 mil for the dividend. This $3.96 mil represents nearly 20% of the dividend declared. Sponsor Frasers Centerpoint Limited (FCL) owns 27% of Frasers Commercial Trust. In a very weird arrangement, the majority shareholders and the cornerstone investors can chose to not get payout at the initial stage. I have written before about the financial engineering of BHG Retail REIT, a recently listed China REIT. 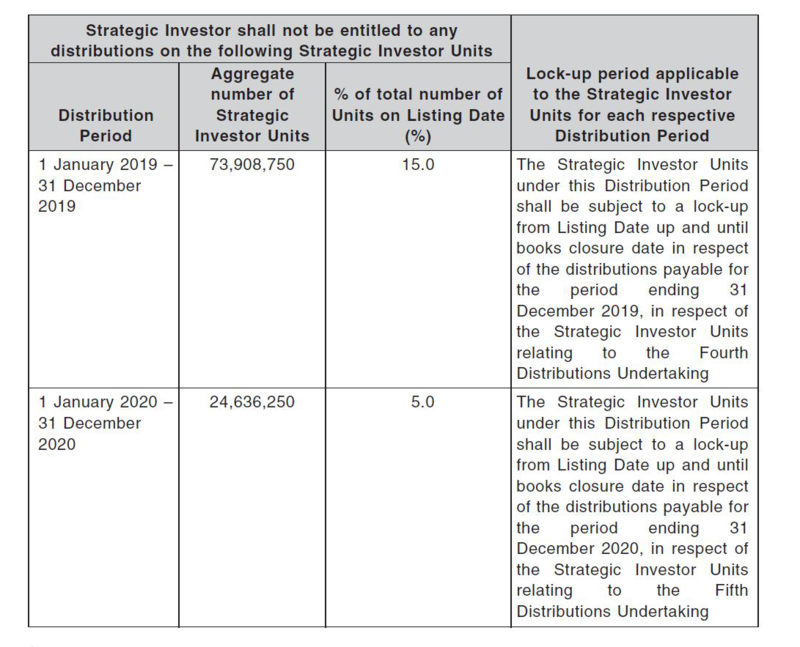 In its prospectus, it indicate strategic investors amount to 30% of shareholders are not eligible to take dividend distributions in the first year, then lesser in subsequent years. This is why they could boost the dividend distributions from 4.5% to 6.4%. Suppose you wish to sell off a commercial building. However, in current market environment or based on current occupancy, you cannot sell it off at a good price. So what you can do is to provide an incentive to the buyers that if they purchase he commercial building, you will provide the difference between what they wish to rent at and current market rent. When you do this, your commercial building is valued at it’s “true value”. The true value: how well the building will rent on average for the foreseeable future. What you are doing is providing income support. Many sponsors who wish to sell an asset into a REIT will do that. There are some good examples. 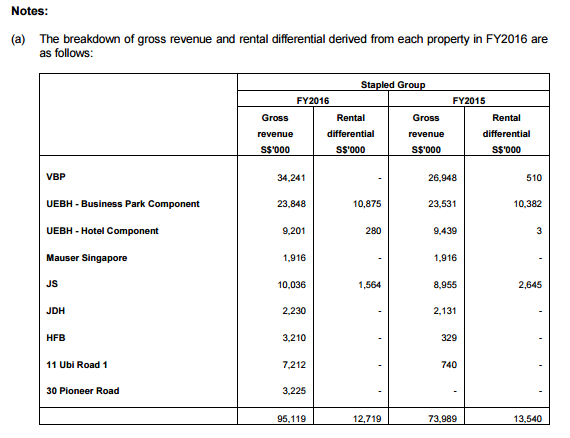 Keppel Land is one company which have sold much of what it develops to Keppel REIT with income support. Notably four of its building, Marina Bay Financial Center 1 ,2 and 3, Ocean Financial Center were sold into Keppel REIT with income support. They were funded by rights issues. 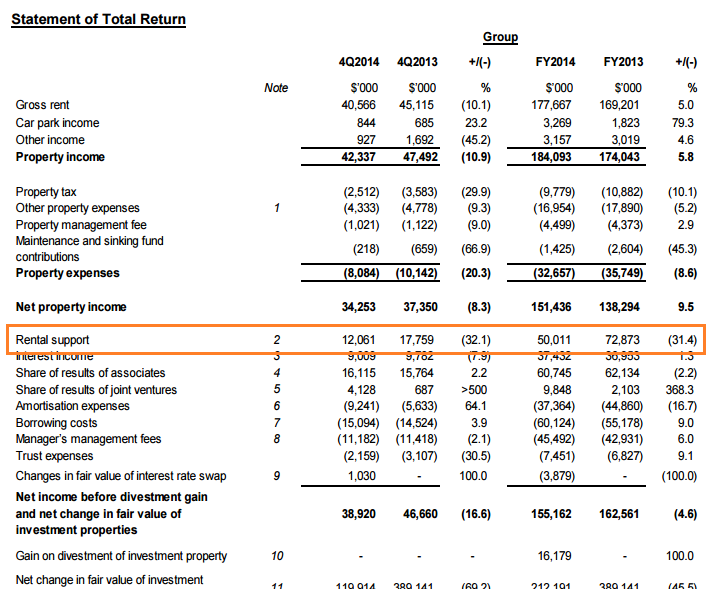 Below the net property income lies the rental support. It is rather sizable. It looks like there are more properties that are under income support than what I have mentioned. OUE Commercial was listed in Jan 2014. From the first day, they have properties on income support. Sometimes rental support is listed under other income. It is not easily spell out. You do have to look at the notes. 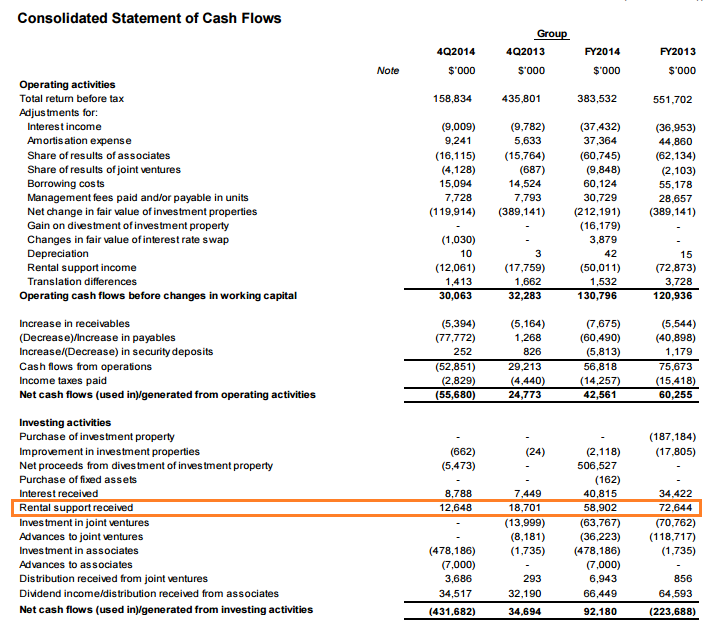 Unlike Keppel REIT, the rental support is not displayed in OUE Commercial’s Statement of Cash Flow. When Viva Industrial Trust got listed, one of the initial IPO assets is UE Bizhub. The anchor tenant is Cisco. Prior to the IPO, United Engineer (UE) wanted to attract an anchor tenant to Bizhub. So they provided an attractive rent, and Cisco committed 25 mil in capital expenditure to renovate the place. The rent is of course below market rent, and the tenure is 5 years which will come due in 2018. 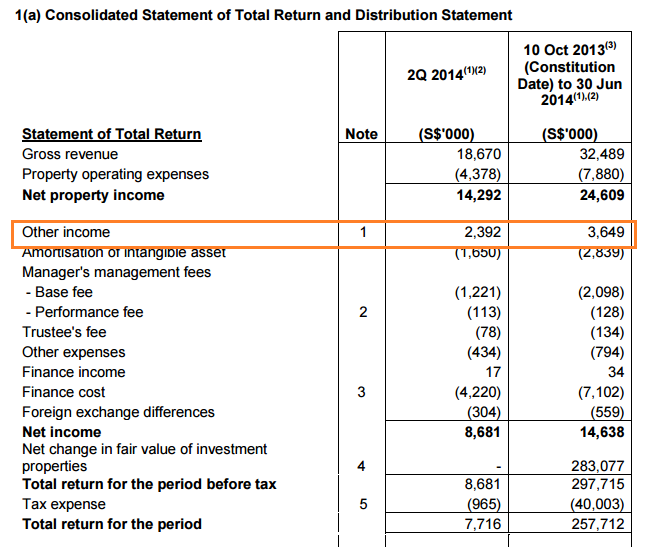 Viva Industrial provided a very clear break down of which building is under income support. Like OUE Commercial, we cannot find traces of income support in the Statement of Cash Flows. What is the Effect of Income Support? Income support are usually implemented with the view that the rent in the future will edge up to meet the market rent. However, a lot depends on what happens in the future. If the lease expires during a poor market environment, the rent collected might drop like a stone without the support, thus less cash flow to pay out as dividend. In a better environment, the renewed rent might be equal or better than market rent. Most investors will view income support as negative because by default, we view this as a deliberate plan by sponsors to dump the asset to the REIT at a high price even though it’s not operating efficiently. Why do these Transactions take place? Given the negative stance I have painted about the act of artificially bolstering the cash flow, one question that is worth exploring is why do REITs still purchase these properties? Majority of REIT sponsors are developers. Developers are in the business of bidding for land, developing the properties, selling the properties to earn and recycling into new land. Thus it is in their interest to sell the properties to the highest buyer. For some properties that are not so attractive, it is their job to dress up the properties well. We have seen how CDL can be innovative in creating the profit participating securities (PPS) for the residential assets that they find it hard to sell off in current climate. Other developers have put out live and rent first with the options to purchase after x years. The REITs will let us know that they have a choice, that not all properties that the sponsors would like to discard will eventually be purchase by the REIT. This would depend on each sponsor. Some REITs have been actively seeking acquisitions that is not developed by their sponsors. This is evidence that it is not always the case the REITs will swallow everything the sponsors throw at them. There are some interesting examples. 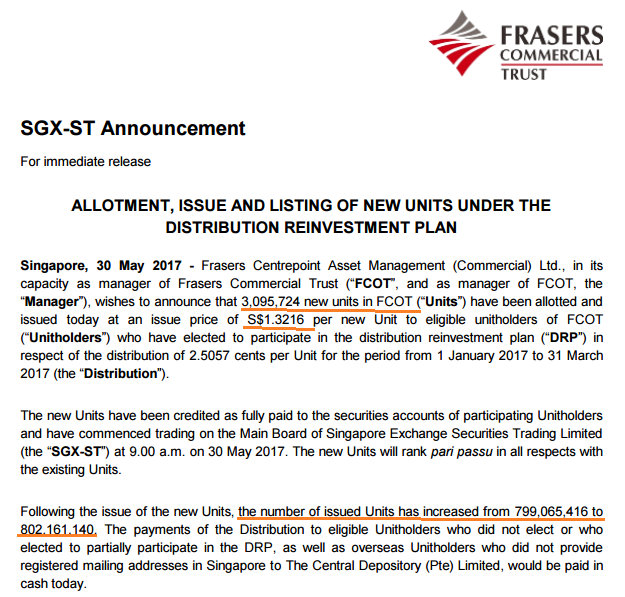 Frasers Centerpoint Limited has a few commercial properties such as Alexandra Point that they should be selling to FCOT as a 99 year leasehold. It is currently no 100% occupied. They could very well dressed it up to sell it into FCOT. However, it is likely FCL also know that it is not easy to make the acquisition look accretive and appealing in other ways to FCOT’s shareholders. Income support is only bad if the story painted by the REIT managers do not pan out. REIT managers frequently say that this is an opportunity to add a “quality asset” to the portfolio. Is this the case? We can only know in the future. For some, the properties do eventually meet the market rent. Due to the age, location and specification, those properties would end up fetching good tenants and rent, but may also have good growth. This enables the REIT to either sell it off, or increase the debt headroom for future acquisitions. These cash flow levers can also be seen as ways the manager can preserve the dividend payout of the REIT. If the dividend payout drops, likely the share price will drop, and that creates possible funding problems for the REIT. With scrip, taking management fees in units, retaining cash in the past, managers can keep the same level of dividend payout, while they execute their plan. One good example is Frasers Commercial Trust. Their China Square is undergoing some asset enhancement, to enhance the appeal with the hotel being developed. This will only be done in 2019. Their main tenant, which comprises 20% of gross rental income is likely to move out of their property in Alexandra Technopark. Asset enhancement to create a more campus like environment is currently being carried out. If the occupancy falls during this period, Frasers commercial have ample levers to keep the payout. The sponsors, FCL, which owns 27%, can take more scrip. They have not paid out management fees in units, so that is another lever. The profits from selling off the land to FCL to develop the hotel in China Square can be used to support the dividend for 1 year as well. The right way of using these information is to understand this particular REIT better. All these prospecting skills is so that we can size up our investments better. We can then form better investment decisions with better knowledge. Be able to spot these cash flow boost. The first thing is to develop the skill that browsing through the financial statements, you will be able to pick up these cash flow boost. I have shown how to find them. Track the Dividend per Unit. In many of the cash flow boost, the transactions can look chaotic to you. As a starting point, use the dividend per unit to be your guiding light. Scrip, or major investors not taking shares, management fees paid in units will likely result in increase outstanding number of shares. This will dilute your shareholdings. Whether this work out well for you or not, you can take a look at the dividend per unit. When all this is settle the dividend per unit should be higher. This means the manager’s actions yield positive results for you the minority shareholders. Then we can move into the detail why the DPU was accretive, whether it is good in the long term. Think through the Magnitude of the potential Cash Flow Boost or de-Boost. Some of the cash flow boost is temporary but their magnitude could be smaller. For example, the scrip or management fees paid in unit are smaller issues. Some income support eventually ends up making very little difference. It is important to discern the cash flow boost that is of a larger impact. For example, a certain REIT received a large income support. Without the income support, the property would not be purchase in the first place. Some boost are so small that if you make a big hoo-ha out of it, you might missed a good opportunity. Default stance is be skeptical. While some of these cash flow boost is done out of necessity, most of these are to attract investors with a better dividend yield. Recognize that until proven otherwise the managers or sponsors are out to take the better deal compare to you. Only when proven others wise do we become less skeptical. Identify how many of these levers have been used. If many levers are already used for the REIT, the REIT have less ways to maneuver in the future. If they haven’t do a lot of these, it means when challenging time comes, they have more tools to work with. This article is part of my series of article on REITs. You can polish your competency in REITs for FREE by visiting my REITs Training Center, where I deconstruct the various nuances of REIT investing. IN the end, I hope investing in REITs is not a zero-sum for the ordinary retail investors aka total returns. I feel you forgot a big one: buy properties with short land lease (ie 30 or sometimes 16 years as seen in some REIT). The cash flow to valuation is huge but this is done at the cost of NAV as those properties depreciate like an ice cream in the sun. HI Pierre, I would consider that an artificial boost to cash flow. we all know what we get when we buy a short land lease. part of it will be a return of capital. If we do not draw the line somewhere, then almost everything will look like its some form of engineering. A lot of REITs do not provide an easy access (or any access at all) to the land lease of their properties. And I feel that when some start with properties which have less than 30 or 15 years of life left (which translate to roughly 3 to 6% depreciation yearly), this is as misleading as sponsor support. hi Pierre, could you cite some examples of the reits that didn’t provide land lease? I thought almost all published them? Great article. Just to add another into the list. As you mentioned financial engineering can provide a boost to capital values and dividends. One case study would be Centro Properties AU. Before 2009, they were aggressively acquiring properties through off balancesheet vehicles, which allowed them to grow at a staggering 60+% 5yr CAGR. So a red flag for a REIT would be in our ability to answer the question “How is this property owned”. Some are transparent like how Capitamall Trust and CapitaCommercial Trust own Raffles City. Others like Centro are a tangled mess of BVI vehicles and co-ownership used to provide false growth at unsustainable valuations.